There’s only 10 days until the release date of My Dead Bunny! You’re invited to join myself and Bunny Brad at one of three events across the country in the next few weeks. Join us for the launch of My Dead Bunny at Writers in the Park! Grab a signed copy of the book and meet Bunny Brad in the (decomposing) flesh. My Dead Bunny will be launched by the incredible Sarah Davis. WHERE: ‘Illustrator Annex’, Centennial Park (near Paddington Gates). I’m also doing some informal illustration workshops from 10am – 12noon in the Illustrator Annex, and I’ll be on the main stage from 4pm for an illustrator battle with Sarah Davis and Lesley Vamos. Writers in the Park is a full day of free events featuring creators of adult and children’s fiction. More info here. 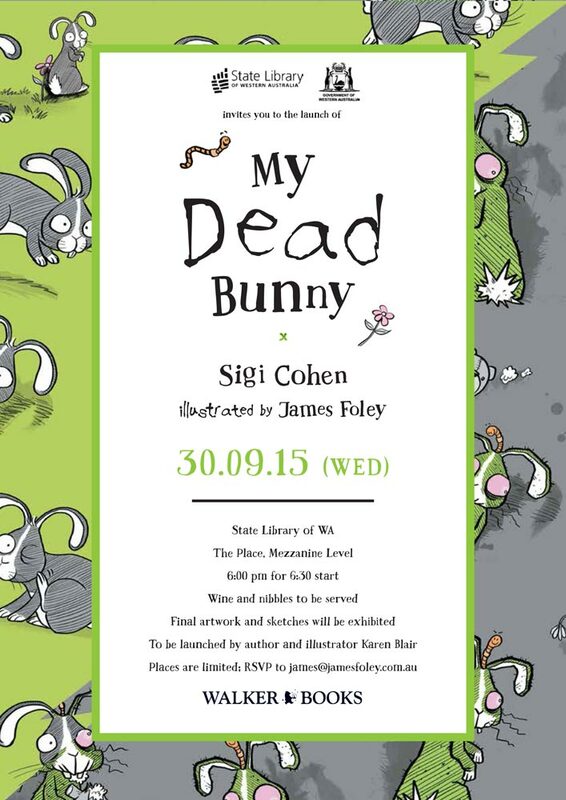 Join us for the My Dead Bunny book launch! Meet Bunny Brad, play ‘pin the eye on the zombie’ and see the original sketches from the book on display. Places limited; RSVP essential. Email james@jamesfoley.com.au with your details. I’ll be signing books and doing drawing demonstrations at the Fed Square Markets. Come say hi! You might also see my demonstrations (and the Dead Bunny book trailer) up on the atrium screen. More info on the Books Illustrated website. Next Next post: My Dead Bunny is out now!